Our principle service is complete restoration, comprising of a full strip down to the bare shell and re-building back to a standard that far exceeds the original factory finish. Using modern techniques and products we ensure that there is no compromise when rebuilding your Mini and using only body panels manufactured by British Motor Heritage and M-machine you can be assured that your Mini is receiving the best quality parts available today. The bodyshell and body components will if required, be media blasted using an ultra-fine glass bead ensuring that no unnecessary damage is caused. From there all the rotten metalwork will be cut away and replaced with new panels. Wherever possible, the new panels will be spot welded together using a proven weld through primer between the surfaces whilst other welding will be done using the MIG welding technique. After dressing the welding work, lead loading will be used to finish off some of the surfaces. All bare metal is then prepared and coated with either a zinc based etch primer or an epoxy primer depending on the requirement of the client. From there all welded joints, nooks and crannies are sealed up with ‘Tiger Seal’ a modern market leading polyurethane sealant whilst other joints will be sealed up using a brush on seam sealant similar to the product used in modern car assembly. Once all the sealants are cured, the underside of the Mini is coated with a product called Raptor. Raptor was developed as a bed liner in the commercial vehicle trade and is a super tough coating product. It is durable, UV resistant, Waterproof, resistant to fuels, oils, salt water etc. 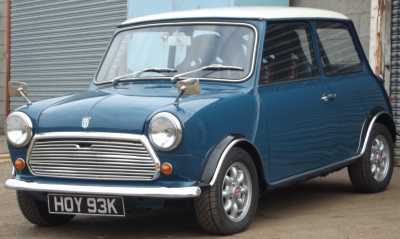 whilst retaining its flexibility and can be tinted to the body colour of your Mini. This new technique replaces the old and outdated stonechip which we used to apply and then paint over separately in body colour and thus saving time and money. Once that process is complete it is time for painting and all our projects are sent to a leading quality classic car paint shop. There the process includes high build primer which is wet flatted down before 2 pack top coat and lacquer are applied and once cured and hardened off wet flatting and polishing complete the process. Whilst all that is going on, the engine of the project is steam cleaned and then thoroughly examined by our mechanical engineer. Dependent on the individual requirements, the engine and gearbox will be serviced here in house or sent away for full or partial rebuild to leading Mini Engine Specialist, RACE Engineering in Chorley Lancashire. The front and rear sub frame assemblies will be stripped down and assessed and components will be replaced as necessary or replaced entirely if required. If the sub frames are in a suitable condition these will be sent away to be shot blasted and powder-coated in any RAL colour of your choice. We even send new Heritage sub frames to be powder coated as we believe this process prolongs the life of the component. Once the Bodyshell and parts return from the paint shop the full re-assembly process begins and again parts are replaced as necessary or entirely to the requirements of the client. Examples of replacement components can be new rubber window and door seals, new headlining or chromeworks etc. The engine is refitted as are the pre-assembled sub frames then a final check over, road test and MOT completes the Restoration. Wax Oil or similar can be added if required although the new Raptor process does eliminate the need for this process. As an option for our clients who have the ability to strip down and re-assemble their own vehicle we are more than happy to have a bare body shell presented to us to receive the same professional restoration and painting as the aforementioned process. We will then return the fully restored and painted shell back to the client to be re-assembled at their leisure. This option saves the client the expenditure of paying out labour charges to have the vehicle fully stripped down and re-assembled here at our workshops. Some clients may not wish to go to the lengths of a full restoration for many reasons. This could be an issue of expense or the fact that the client wishes to keep the vehicle as original as possible which is the probable case in many of the restorations that we undertake on early Mk1 minis, the Wolseley Hornet, and the Riley Elf. We therefore offer what we like to call our ‘Sympathetic Restoration Service’ which factors in these requirements wherever it is practical to do so. The same methods, quality workmanship and parts will be applied as in the full restoration process to the areas that are worked leaving other parts of the vehicle in as original condition as possible. As it will be appreciated though, we can only guarantee quality to the areas that we have worked on with no guarantee being given to the areas that have not been worked on. Similarly, we can carry out professional body repair work to your Mini. It may need a sill replacing, a wing replacing or even a door rebuilding and re-skinning. All this can be done and again the work to these areas alone can only be guaranteed. We do not do small repair patches such as welding on plates over rusty holes etc. as this does not meet with our quality standards and ethos. We offer a flexible interest free payment plan to all our clients and a free collection and delivery service for your project which are both subject to terms and conditions. A regular update of your project with photographs will be emailed to you the client throughout the process of the project although clients are always encouraged to make regular visits in person to see the progress of the restoration for themselves.